Cloud Computing and Big Data Analytics: What Is New from Databases Perspective? Many industries, such as telecom, health care, retail, pharmaceutical, financial services, etc., generate large amounts of data. Gaining critical business insights by querying and analyzing such massive amounts of data is becoming the need of the hour. The warehouses and solutions built around them are unable to provide reasonable response times in handling expanding data volumes. One can either perform analytics on big volume once in days or one can perform transactions on small amounts of data in seconds. With the new requirements, one needs to ensure the real-time or near real-time response for huge amount of data. 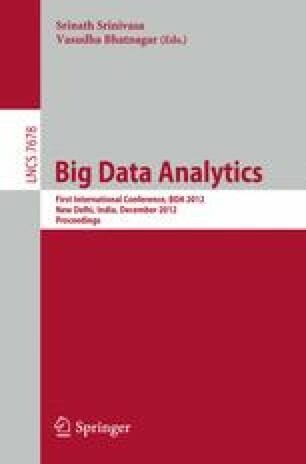 In this paper we outline challenges in analyzing big data for both data at rest as well as data in motion. For big data at rest we describe two kinds of systems: (1) NoSQL systems for interactive data serving environments; and (2) systems for large scale analytics based on MapReduce paradigm, such as Hadoop, The NoSQL systems are designed to have a simpler key-value based data model having in-built sharding, hence, these work seamlessly in a distributed cloud based environment. In contrast, one can use Hadoop based systems to run long running decision support and analytical queries consuming and possible producing bulk data. For processing data in motion, we present use-cases and illustrative algorithms of data stream management system (DSMS). We also illustrate applications which can use these two kinds of systems to quickly process massive amount of data.